According to Ford, affected vehicles may suffer from engine overheating, which can lead to fluid leaks. If the leaked fluid comes in contact with hot exhaust steam, a fire may occur. Ford’s safety recall concerns 73,320 Ford Escapes and 15,833 Ford Fusions in North America. Only Escape SE and SEL models with a 1.6-liter EcoBoost engine are affected. Ford’s latest recall is the result of countless reports of engine overheating and vehicle fires. In fact, National Highway Traffic Safety Administration documents indicate that there have been 13 fires reported, 12 of which were in Ford Escapes. The problem has been so prevalent lately that Ford launched a task force earlier this month to further investigate the situation. Although most safety recalls are accompanied by a recall schedule, Ford does not yet have any repair plans in place for customers. The automaker is presently developing a solution to the problem and customers will be notified as soon as possible. Ford Escape and Ford Fusion owners are encouraged to make arrangements with the dealers to bring in their vehicle and obtain a loaner vehicle. Simply put, owners should take their vehicle to the dealer rather than running the risk of engine overheating. In the meantime, concerned customers can contact Ford at 866-436-7332 or the NHTSA Vehicle Safety Hotline at 1-888-327-4236. Ford Escape and Ford Fusion owners can also visit www.ford.com to find out more information concerning the recall. Upon visiting the website, simply click “View Notices and Recalls,” then enter the vehicle’s 17-digit vehicle identification number. Owners should bear in mind that there are several indicators that their vehicle may be affected. Instrument cluster warnings like “Engine Power Reduced to Lower Temps” and “Engine over temp, stop safely” are both signs that engine overheating might be occurring. 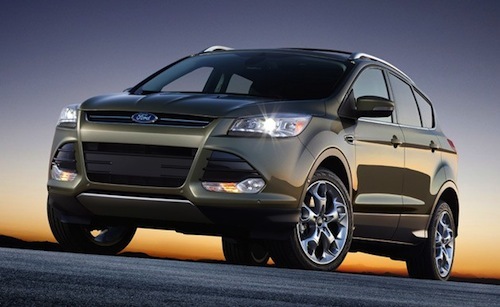 Friday’s Ford Escape recall is the fourth recall on the 2013 model this year. Most alarming is that it’s the third fire-related recall so far. In July, the automaker recalled 11,500 2013 Escape SUVs with 1.6-liter engines over fire dangers. According to Ford, over 90 percent of vehicles covered in the recall have been repaired. Unlike Friday’s recall, July’s safety recall concerned a damaged fuel line rather than engine overheating. Ford issued a second fire-related recall in September, claiming that an improperly installed part may cause a fire. The recall affected 7,600 Escape models with 1.6-liter engines. Aside from fire troubles, the 2013 Ford Escape was also recalled over brake concerns. Specifically, over 10,000 Escape SUVs were recalled due to improper brake pedal clearance resulting from mispositioned carpet padding. Despite the Escape’s recurring issues, today’s recall is the first in relation to the 2013 Ford Fusion.